According to the National Institute on Deafness and Other Communication Disorders (NIDCD), approximately 15 percent of American adults ages 18 and over report some trouble hearing. 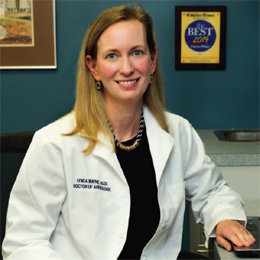 In other words, hearing loss affects much more than meets the eye— and Dr. Lynda Wayne, Au.D, FAAA and owner of Cadence Hearing Solutions is tackling that number one patient at a time. Dr. Wayne decided on opening Cadence Hearing Services back in 2006 after recognizing a need among a large population suffering from hearing loss. She runs a practice specialized in patient centered care dedicated to providing individualized attention to each patient’s hearing needs. Cadence Hearing Services offers a full gamut of services to patients, including audiological screenings, audiologic evaluations, hearing aid services including hearing aid fittings, hearing aid followups and repairs, Tinnitus rehabilitation and customized ear plugs for musicians and more. Dr. Wayne ensures each patient is treated with care and concern, regardless of time taken. She wouldn’t run her practice any other way. Hearing loss may also in turn, be accompanied by Tinnitus. Tinnitus does not however, affect every patient in the same manner, and not every patient experiencing hearing loss will suffer from Tinnitus. Considering that Tinnitus is not a “onesize- fits-all” symptom, Cadence Hearing Services tailors their treatment approach based on the specific issues of each patient. Patients are required to fill out a four to five page Tinnitus questionnaire to target areas of trouble and to find a solution. Solutions for patients, Dr. Wayne adds, range anywhere from turning the fan on at night to mask Tinnitus symptoms, or purchasing a sound machine to place along their nightstand. For those in the moderate to severe category, Dr. Wayne suggests considering Neuromonics, a therapeutic device similar to an MP3, to be worn no more than a maximum of four hours per day, over the course of four months. “The device retrains the brain into thinking the sound the patient is hearing is not a negative sound,” she mentions. “The device is an interesting concept. It’s an FDA approved device, and not many people know about it.” . While hearing aids have been traditionally known for their blatant visibility to the public eye, many recent technological advancements have catered to these concerns of the market. In turn, hearing aids have shrunk in size and have evolved in both material and function, now tuned to fit each patient individually. Dr. Wayne also says Apple users are in luck with the new iPhone software that allows patients to pair their hearing devices to their phones. .
“You can even locate your hearing aids with your iPhone if you ever lose them,” she adds. “This alone, has revolutionized and been a huge step up for hearing aid technology. .
“We’re also seeing more rechargeable hearing aids on the market, in addition to smaller devices, and hearing aids that can be left in the ear for two months at a time,” Dr. Wayne continues. “We now have hearing aids you can swim with called the Lyric, too. One company we work with also released the smallest hearing aid I have ever seen in years called the Titanium. It’s amazing to see all of the possibilities.” . Every patient of Cadence Hearing Services and of Dr. Wayne will not leave without thorough education on preventative measures they can proactively take to prohibit worsening symptoms. Patients are encouraged to: . ¦ Look into custom ear molds and hearing protectors, especially those exposed to loud noise for prolonged periods of time, such as musicians or construction workers. ¦ Over the ear muffs to protect hearing while mowing the lawn. ¦ Keep music or volume on your TV low. ¦ Keep earbuds or headphones low enough that others around you cannot hear your music. Though Dr. Wayne says hearing aids are built to last up to roughly five years—or in the rare case, eight years—she stresses the importance of regular routine care and visits, as hearing aids are susceptible to moisture and wax. The process of where to begin can often be daunting, with an abundance of information at the touch of consumer fingertips. Fortunately, Cadence Hearing Services specializes in only four major hearing aid manufacturers, ensuring patients have a choice of both technology and product. Dr. Wayne mentions this is for the mere fact one product is not ideal for each person seen. In addition, the practice works with every budget, including no interest financing, so affordability does not prohibit patients from receiving their long anticipated treatment.